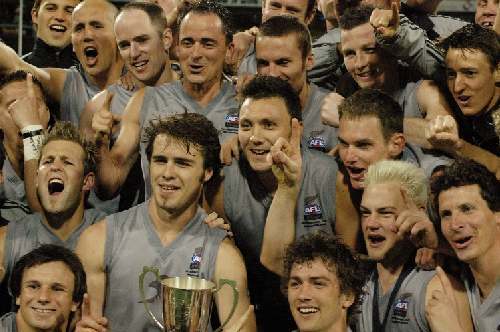 New Zealand held off Papua New Guinea to win the 2005 Australian Football International Cup this evening, running out 7.8.50 to 5.2.32 winners. With a crowd of international footy diehards and earlybirds starting to filter in for the Carlton-Collingwood match, New Zealand and PNG lined up with their respective war dances, then hit the ground with some very tough, physical football in the first ten minutes. New Zealand kept the ball in their forward line for most of the start of the match, but pressure from PNG left the Falcons unable to get clean posessions and the Mozzies eventually broke through for the first goal of the game when after a quick break down the ground Dominic Livuana received a handpass out of the pack in close and converted. Undaunted, the New Zealanders got a quick clearance from the centre, then switched the play across the half forward line where Caleb Stick goaled on the run from around 50 metres out with a high quality kick. As the quarter time siren sounded, the Falcons lead 1.2.8 to PNG 1.0.6. A feature of the match was the contrast between New Zealand's highly structured gameplan based around working to key position players and the running, possession game of Papua New Guinea. The Mozzies found it tough to get past half forward though, with New Zealand's size in defence proving a difficult barrier for the smaller Papua New Guineans to overcome. The second quarter started with the same intensity as the early part of the match, Craig Ashton scoring New Zealand's second goal with a gather off the ground within the first minute. PNG's Desmond Kaumu took an athletic, stretching mark five minutes in, but was unable to convert and the game settled into a tough slog in the PNG forward line until the Falcons broke away, a fast break downfield finishing with James Bowden snapping a goal over his shoulder. PNG kicked the last goal of the half, Alister Sioni awarded a free kick in front of goal and converting to bring PNG back within seven points at the half, New Zealand 3.3.21 to PNG 2.2.14. Bowden kicked the first goal of the second half, then after some desperate attacking by the Falcons resulting in a string of behinds, Steve Froggatt took a mark close to the line, ran forward and kicked what he thought was a goal, before the goal umpire signalled that he'd actually crossed the line and scored a rushed point. Papua New Guinea's only score from the quarter came from Stanley Tapend, goaling on the run from about 45 metres after some scrambling defence from the Kiwis. This was followed soon at the other end of the ground, by a kick out from PNG's fullback going straight to Geoff Thomas, who goaled to give New Zealand a 17-point lead at the last change. The Mozzies came out blazing, determined not to let the game slip away, and scored two quick goals through Overa Gibson and Sioni, to see them only 5 points down five minutes in. Bowden then kicked a great goal on the run to put the Falcons back 11 points ahead, then a kick from Froggatt to Craig Ashton set Ashton up to kick the sealer for New Zealand. When the final siren sounded, New Zealand were victors by 18 points. Best on ground was New Zealand goalsneak James Bowden, with Alister Sioni best for Papua New Guinea. Visit our International Cup multimedia section to listen to interviews with New Zealand Captain Andrew Congalton, Coach Jim Lucy and General Manager Rob Malone.